B cells are important in helping the immune system fight pathogens. However, in the case of the neurological autoimmune disease multiple sclerosis (MS), they can damage nerve tissue. When particular control cells are missing, too many B cells accumulate in the meninges, resulting in inflammation of the central nervous system. A team from the Technical University of Munich (TUM) demonstrated the process using animal and patient samples. The fight against illnesses and pathogens requires activation or deactivation of a large number of cell types in the immune system at the right place and the right time. In recent years, certain immune cells, the myeloid-derived suppressor cells (MDSCs), have received increasing attention in this context. They function as an important control mechanism in the immune system and ensure that immunoreactions do not become too strong. In the case of MS, these controls in the nervous system appear to fail in part. 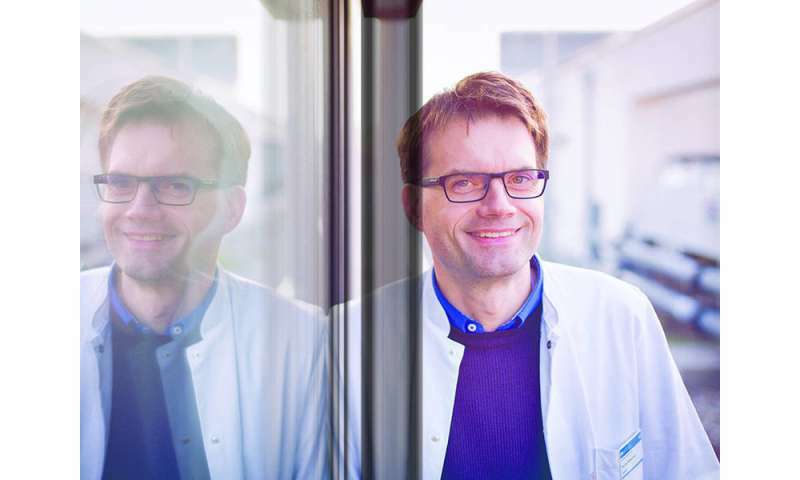 The team led by Thomas Korn, professor for experimental neuroimmunology at the TUM Neurology Clinic, succeeded in demonstrating this in a study published in the journal Nature Immunology. During MS, the body attacks its own nerve tissue, resulting in damage and inflammation. This can lead to paralysis, as well as vision and movement disorders. "We were primarily interested in the control effect of the MDSCs on the B cells. Their function in the occurrence of MS is not yet clear. But they appear to play an important role, something we wanted to take a closer look at," says Korn, explaining the study's objective. B cells can develop into cells that produce antibodies, but they can also activate other immune cells by secreting immune messengers. Korn and his team used a mouse model in which the inflammatory disease can be triggered and develops much the same way as in the human body. The team removed the MDSCs from the meningeal tissue and then observed an increase in the accumulation of B cells there. At the same time, inflammation and damage occurred, triggered by the high number of B cells in the nerve tissue. This phenomenon did not occur when enough MDSCs were present, controlling the number of B cells. In the future, Korn and his team want to explain how the B cells destroy the nervous system. According to the researcher, there are two possibilities: In the meninges, B cells emit substances that attract immune cells, which incorrectly destroy the body's own tissues; or B cells activate immune cells in the blood and lymph systems, which then move to the meninges, where they cause damage. Based on 25 tests of the cerebrospinal fluid (CSF) of subjects with MS, the lack of MDSCs could also have a negative effect on the course of the illness in patients. When the researchers found large numbers of MDSCs in CSF, the patients usually also experienced milder symptoms with fewer episodes of inflammation. In contrast, patients with lower MDSC counts experienced stronger symptoms. "There are already approved therapies in which B cells are regulated and suppressed on a medicinal basis. Now, we've provided an explanation of why this could be an effective treatment, at least in cases where the course of the disease is poor," says Korn. Since the number of subjects tested in this case was small, he and his team are planning larger patient studies for the future. Can myeloid derived suppressor cells subdue viral infections?